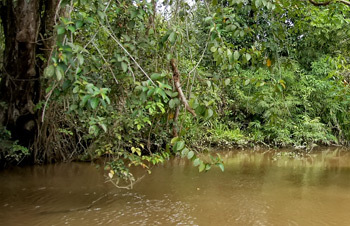 Berbak National Park is also a habitat for the Sumatran rhinoceros (Dicerorhinus sumatrensis sumatrensis), Sumatran tiger (Panthera tigris sumatrae), Malayan tapir (Tapirus indicus), lesser Malay mouse deer (Tragulus javanicus kanchil), 300 bird species including Chinese egret (Egretta eulophotes), lesser adjutant stork (Leptoptilos javanicus), all species of kingfisher (Alcedinidaespp. ), white-winged wood duck (Cairina scutulata), Malayan giant turtle (Orlitia borneensis), and batagur turtle (Batagur baska). There are hundreds, even thousands of migrant birds can also be seen in this Park, making an amazing sight when they are flying through the air in a flock.